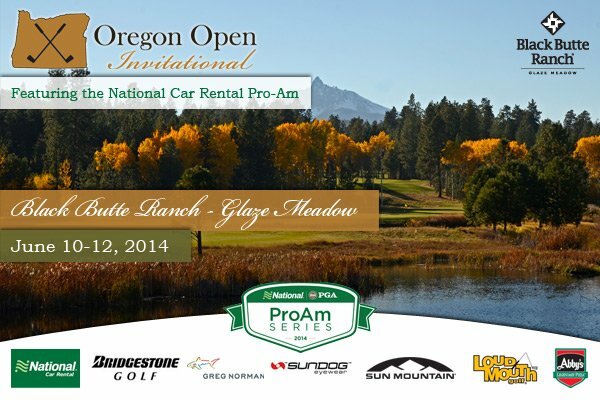 Oregon Open Invitational ~ Come enjoy Black Butte Ranch! Team entries are still available for the Oregon Open Invitational at Black Butte Ranch – Glaze Meadow Course on June 10-12th. Entries close Wednesday, May 28th, so hurry and get your team entry in now! PGA Director of Golf Jeff Fought is excited to host this year. New for 2014 is the National Car Rental Pro-Am Championship. Thanks to a nice sponsorship through the PGA of America, National Car Rental will be the sponsor of the team competitions. They ask one thing….enroll all players in the Emerald Club, National Car Rental’s FREE tool to help you use the PGA discounted rate and also ease the rental process by allowing you to bypass the rental counter. To be eligible for the team competitions, all players on the team must be Emerald Club members (current membership qualifies) and there is a place on the entry form to provide each player’s Emerald Club number. It takes just a couple of minutes. code XZ41557 when you rent from National. Amateurs can register by clicking here. Amateurs, be sure to use PGA discount code XZ41570 when you rent from National. National Car Rental is not only providing the team purse but the low team will be entered into a chance to win golf with Keegan Bradley and his father, PGA Professional Mark Bradley. Thank you for supporting this important new sponsor. Last year, amateur Hans Reimiers of Columbia Edgewater CC won the Oregon Open Invitational by one stroke over PGA Professional Darren Black of Rainer G&CC, PGA Professional Scott Erdmann of Lake Oswego CC and amateur Michael Haack of Meridian Valley CC. Both Reimiers and Black came out hot for the final round posting 6-under par 66’s. Winning the Best 2 of 4 Net competition was the team of PGA Professional Rob Clark of Wenatachee G&CC, PGA Professional Cameron Fife of Persimmon CC, amateur Mark Crose of Juniper GC and amateur Scott Wacker of The Oregon GC. They scored a 133-129-262 to win by one stroke over the team of PGA Professional Greg Manley of Meridian Valley CC, PGA Professional Brian Thornton from Meridian Valley CC, amateurs Tom Mallory from Auburn GC and amateur Steve Deshler from Auburn GC. Winning the Four-Ball competition is PGA Professional Joe Korn of Nile GC and his amateur Matt Huft of Foster Golf Links who fired rounds of 66-60-126. They won by five strokes over the team of PGA Professional Ben Nelson of Tacoma Firs GC and his amateur Sandy Vaughan of Glen Acres GC. Glaze Meadow was originally built in 1978, with the restoration completed in April of 2012. Famous architect John Fought was hired to redesign the course. After Fought’s enhancements, the course earned first place honors in 2012 Golf Inc. Magazine’s Renovation of the Year competition for public courses. The course was featured in the summer edition of the magazine. Black Butte Ranch is perfectly positioned for an authentic Central Oregon cascade experience; it is nestled beneath the Cascade Mountain range with sweeping views of Three Sisters, Mount Washington, Black Butte, and many more. In addition to Glaze Meadow course, Black Butte Ranch is also home to Big Meadow course. Big Meadow was honored in 2013 by GOLFWEEK Magazine as one of the “Best Courses you can Play” in Oregon. In addition to the world class golf tracks, Black Butte Ranch offers an indoor pool complex, four outdoor swimming pools, a full service day spa, 18 miles of paved walking and biking paths, and a wealth of outdoor recreation opportunities including horseback riding, tennis, pickle ball, bocce ball, canoeing, paddle boarding and fly fishing. The recreational opportunities at the Ranch are limitless. Come experience everything Black Butte Ranch has to offer with your family and your team mates! Hope to see you all at Black Butte Ranch – Glaze Meadow in June!